A displaced Iraqi Christian woman prays at the home where she is staying in Erbil. Photo courtesy of Mackenzie Knowles-Coursin for The United States Holocaust Memorial Museum. On Tuesday, February 9th and on Wednesday, February 10th, Florida Atlantic University (FAU) in Boca Raton and the University of Miami (UM), respectively, had the honor of hosting a presentation by the United States Holocaust Memorial Museum (USHMM) entitled “Exposing the Darkness: Perspectives on Mass Atrocities.” The panel discussion featured human rights experts Naomi Kikoler, Deputy Director at the Simon-Skjodt Center for the Prevention of Genocide at the USHMM, and photographer Mackenzie Knowles-Coursin. This brilliant, powerful discussion was co-hosted by FAU’s Center for Holocaust and Human Rights Education and by the University of Miami Hillel. In 2015, Kikoler and Knowles-Cousin travelled to northern Iraq to document evidence of mass atrocities carried out by the self-proclaimed Islamic State (IS). The USHMM report found that IS has committed crimes against humanity, war crimes, and ethnic cleansing against various minority groups and perpetrated genocide against the Yezidi people. “The event discussed previous atrocities, such as the Holocaust and crimes in Iraq, and brought forth ideas on how these atrocities could be prevented,” stated Michael Bezjian, a University of Miami Armenian Student Association (UM-ASA) member who was present at the Miami panel. Knowles-Coursin’s work focuses on identity within the context of migration and statelessness, so his photographs documenting the Islamic State’s brutality brought to life the plight of the displaced and persecuted. Florida Armenians were encouraged to attend the USHMM discussion in the hopes of raising awareness and broadening perspectives on genocide and man’s inhumanity to man. “Growing up as an Armenian American, I’m no stranger to the stories of genocide, as they were told to me by my grandparents, who learned from their parents. 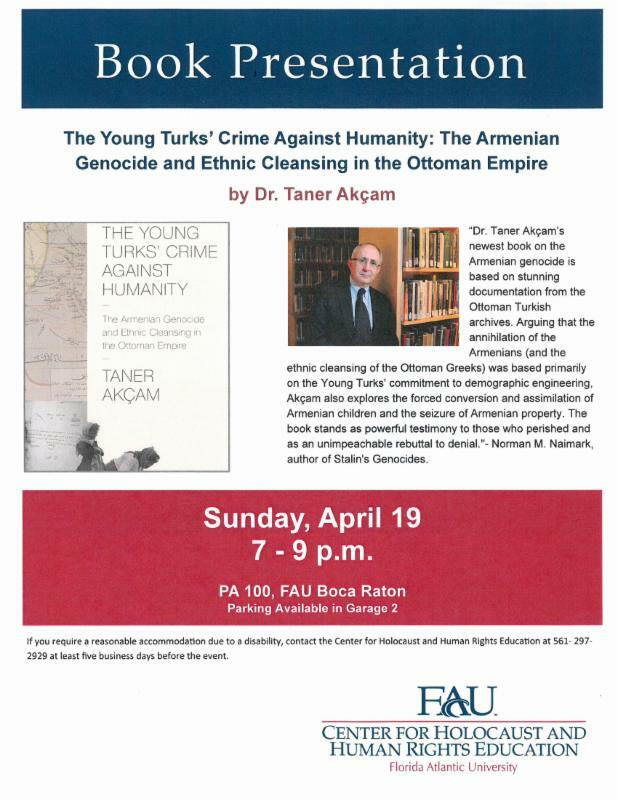 Attending high school in South Florida, we learned about Nazi Germany and the atrocities that took place in the concentration camps during WWII,” stated Florida Armenians Boca Raton Chair George Sarkisian who was present at the FAU presentation. “’Exposing the Darkness: Perspectives on Mass Atrocities’ was truly eye-opening, and really put in context the level of violence currently taking place in Iraq and Syria. The pictures and stories shared by the panelists provided a small but powerful glimpse into the lives of the people suffering at the hands of ISIS. I was especially touched by the pictures and stories of the displaced people living in camps located in northern Iraq and it feels like the history of the Armenian people a century ago may well be repeating itself today,” Sarkisian said. 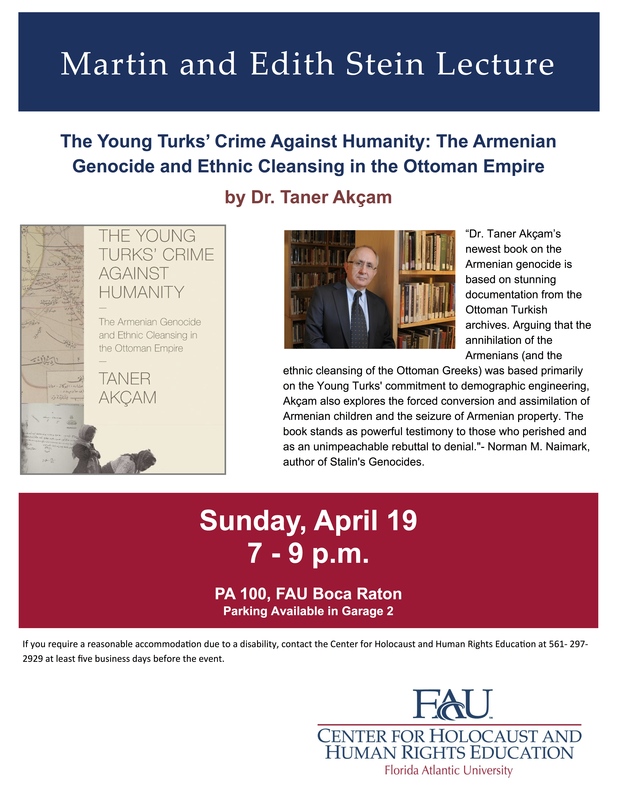 As part of Florida Atlantic University’s (FAU) Center for Holocaust and Human Rights Education (CHHRE) Martin and Edith Stein Community Lecture Series, Dr. Taner Akçam will discuss his book, “The Young Turks’ Crime Against Humanity: The Armenian Genocide and Ethnic Cleansing in the Ottoman Empire,” on Sunday, April 19, 2015 from 7:00 PM to 9:00 PM in PA 100, FAU, Boca Raton, Florida. 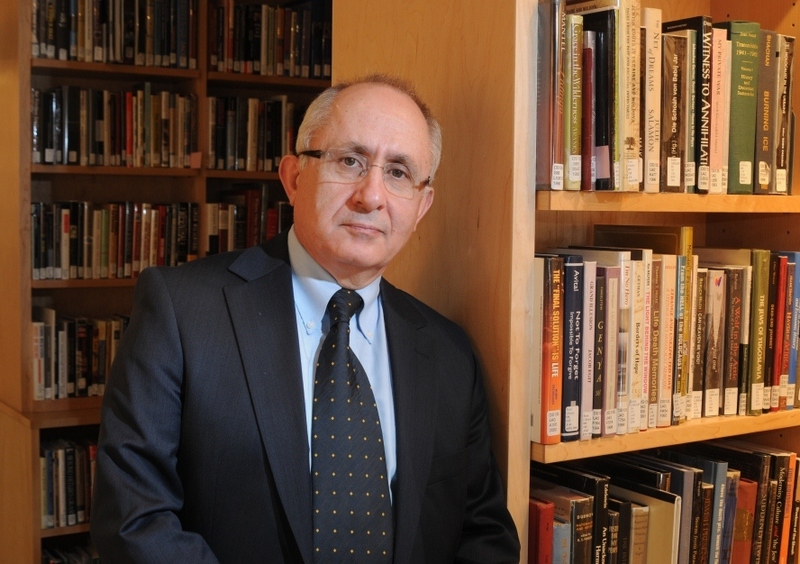 Dr. Akçam is Robert Aram, Marianne Kaloosdian and Stephen and Marian Mugar Chair in Armenian Genocide Studies at Clark University. This program is part of south Florida’s commemoration of the 100th Anniversary of the Armenian Genocide. Online registration is available here.